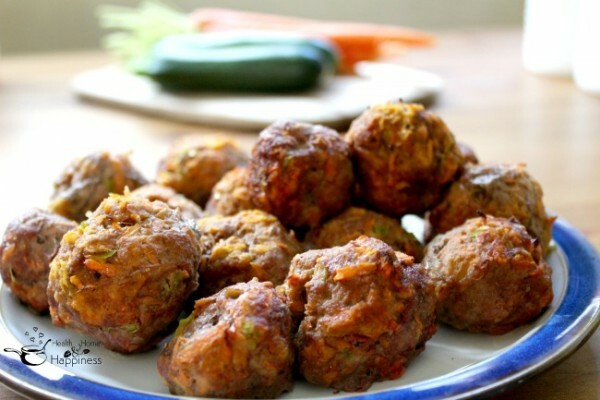 Grain Free Meatballs: Grated veggies are the perfect alternative to breadcrumbs! 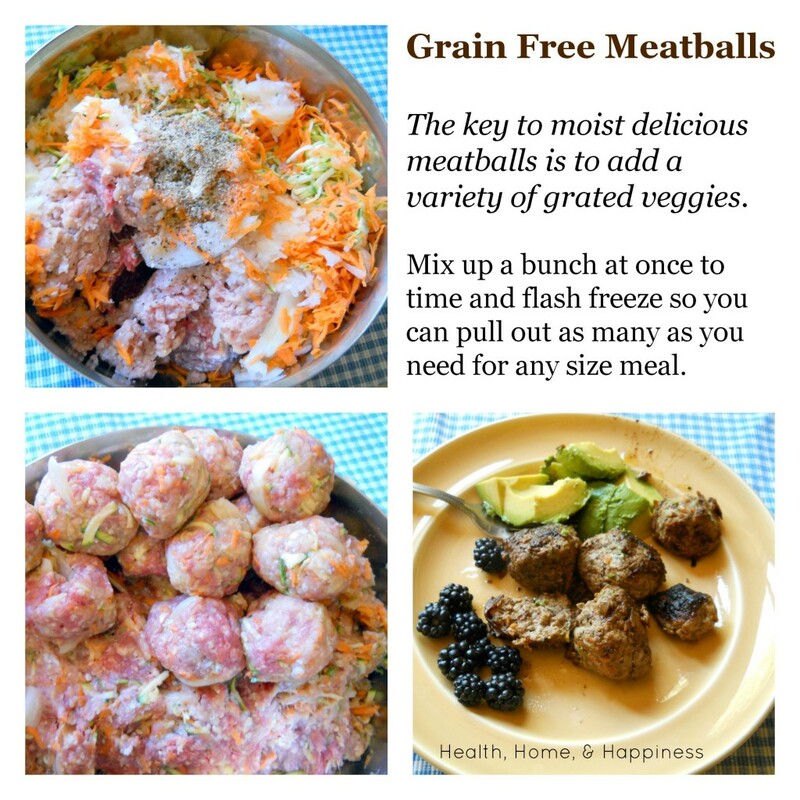 Home » Do it yourself and save » Grain Free Meatballs: Grated veggies are the perfect alternative to breadcrumbs! These meatballs are packed with veggies for flavor, moisture, and nutrition. 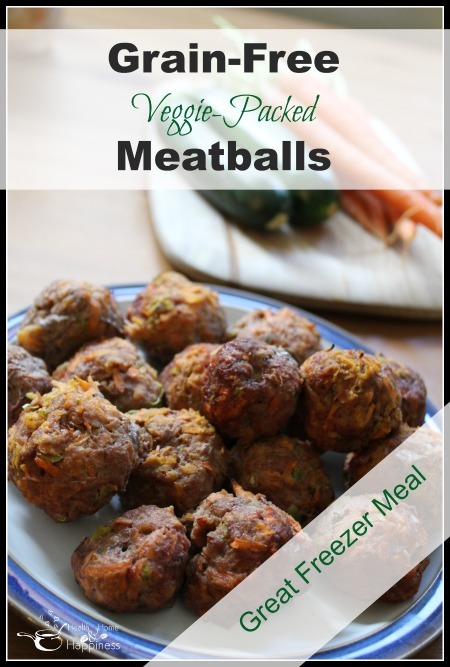 These are from the Grain Free Freezer Cooking Guide and the recipe makes enough that you’ll be able to pull out a few meatballs for lunch, or to add to red sauce and spaghetti squash for dinner, or eat as a main dish for 4+ meals, depending on your family size. If you have a mesh cover for your skillet, use it to prevent meat splatters from going all over your kitchen. 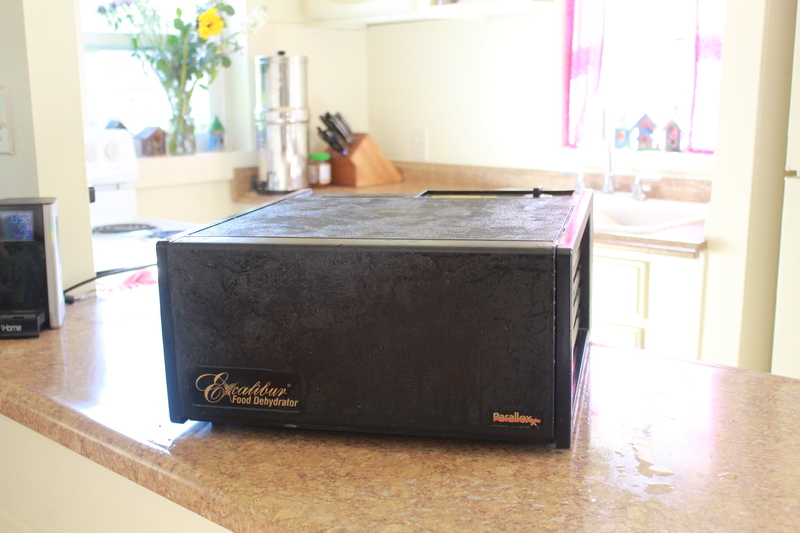 Perfect for the freezer, this makes a lot of meatballs! Using a food processor or grater, grate the carrot, onion, and zucchini. Mix in with the meat, adding in salt and pepper. Form into balls (you can do this right in the same bowl you mixed the meat in to save dishes). In a large skillet over medium heat, melt 1 tablespoon bacon drippings or other animal fat like butter or tallow. Add meatballs in a single layer, with a little space between each meatball (amount will depend on size of pan). Fry, turning every couple minutes, for 10-15 minutes or until browned on the outside (they will continue cooking inside when reheated). Remove to a plate to cool. Alternatively, place on a single layer on a baking sheet and bake at 375 degrees for 25 minutes, or until inside is no longer pink. Storage instructions: Freeze meatballs in a single layer on a cookie sheet. Transfer frozen meatballs to a zip top bag and return to freezer. Reheating instructions: Thaw desired amount overnight or all day. In a skillet over medium high heat, melt 1 tablespoon fat. When fat is melted add meatballs and cook covered, rolling every couple minutes, for 10 minutes. container that you froze the recipe in. This reminds you what ingredients were used (fill in the blanks for the meat you used, and mark any changes you made to the recipe as well- this is explained in more detail in the Freezer Cooking Guide), and the reheating cards allow anyone know how to pull something out of the freezer and cook it up for dinner. If you’d like printable re-heating cards for this recipe, click here. 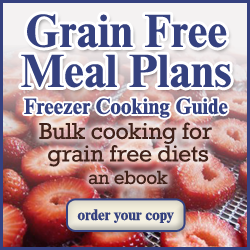 To learn more about the freezer cooking guide, click here. Hi! Your website is so nice but it would be great if you could add a ‘print’ option so I would be able to keep your information on hand. Unless it’s here and I just can’t find it :-). It’s light green, just above the red ‘sharing is caring’. I like to have a printed version on hand too. Can you put these under the broiler instead of frying? When I was growing up we made our own meatballs but we did them under the broiler. I always make my meatballs under the broiler. I would make these under the broiler too. This is such a kool recipe. Can this be turned into a burgers instead of a meatballs? The first night I cooked half of the recipe as recommended above, and they were quite tasty. The second night I pan fried them into smaller, kid-sized meatballs and then simmered them in homemade marinara sauce for 20-30 minutes and served them over roasted spaghetti squash. 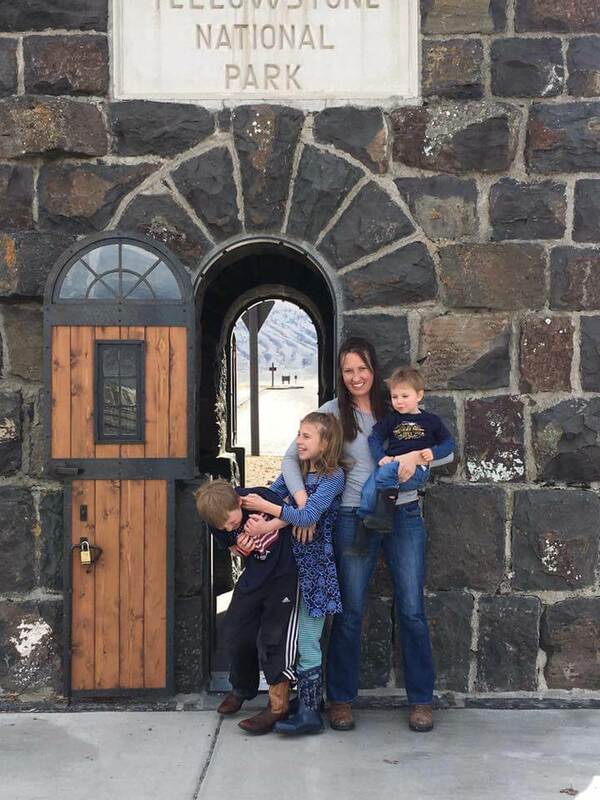 It was loved so much by my husband, 4 year old, and just now 2 year old (and me ;)). This meatball recipe is so versatile and very moist/tender. Thanks! THANK YOU SO MUCH! I have been searching for a meatball recipe that does not require eggs, cheese or bread crumbs. This will be so very helpful. Thank you again. I make meatballs just like this but put them on a baking sheet in the oven. A lot less messy and you don’t have to turn them. I’m not sure how long they take but I just put in at 350 and keep an eye until they look done – then cut one open to check. Can these be used in the intro? How did you cook the liver and about jow much did you add?